Once again I was back for a weeks fishing at one of my favourite places on earth, The Florida Keys. 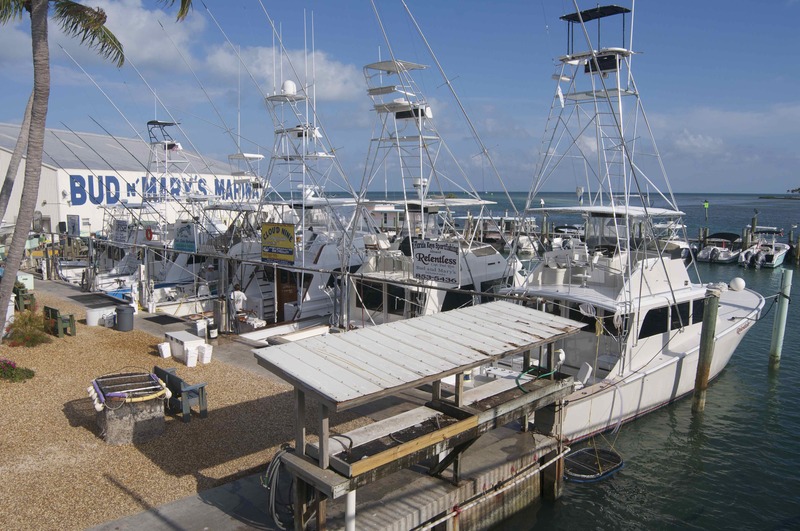 Each year a group of us return to Bud n Mary’s famous marina base at Islamorada, mostly to experience the thrill off hooking, fighting and then releasing the 100lb+ tarpon the area can boast in abundance from March through until July. Tarpon aside, there are a plethora of other species of sport fish to keep us occupied, and it is not unusual to catch as many as five different species in excess of 100lb during our week long trip. This year, however, the weather through a spanner well and truly into our plans. Unseasonably strong south-easterly winds had been hammering The Keys for weeks, and which looked set to continue through most of our trip. The wind had stirred these usually clear turquoise tropical seas to a milky white, and this and the continuing unsettled conditions had made tarpon fishing difficult. 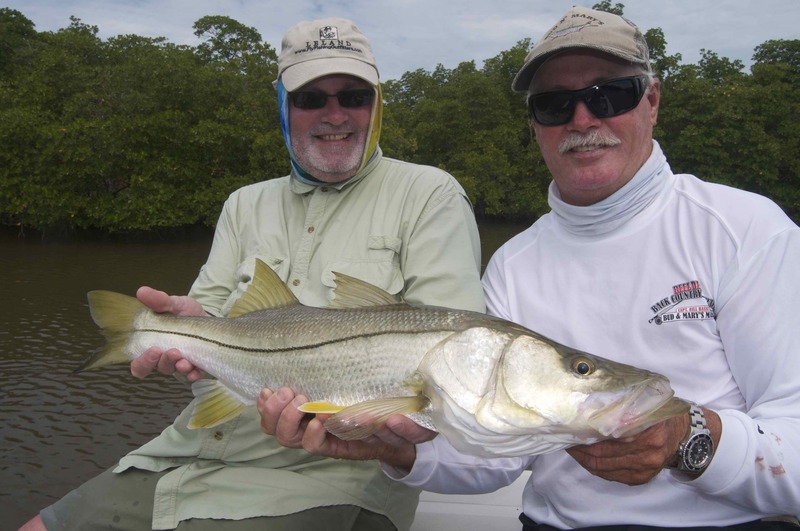 One of the big advantages with basing ourselves at Islamorada is that always when weather is a problem there are other exciting fishing options to choose from, and it was this adaptability that turned our weeks fishing around from mediocre to truly amazing. The turning point for our trip came on the morning of our third day. I was drinking my morning coffee in the marina cafe at when one of our regular guides on these trips, Capt. Jim Wilcox, came in an asked my if a few of us would like to do something a bit different? He suggested we run north across Florida Bay towards Cape Sable, the most southerly point of the US mainland, cut through the the East Cape Canal, then continue heading north up the west coast before turning sharp east and entering the labyrinth of narrow creeks, cut, canals and lagoons that form the southern section of the Florida Everglades. Mostly we would be sight fishing he explained, casting baited jigs for redfish and snook, but should also expect to catch plenty of other species. It would be, he explained, “a trip over to the dark side”! Of course Jim sold us the idea of the trip, however such was the remoteness of the area we would be fishing he went on to explain that it was necessary for two boats to accompany each other, just in case of any mechanical problems. A short while later, the sun yet to break above the horizon, four of our group were skimming at high speed across the flats. Myself and my friend Andrew Leaves were fishing with Capt. 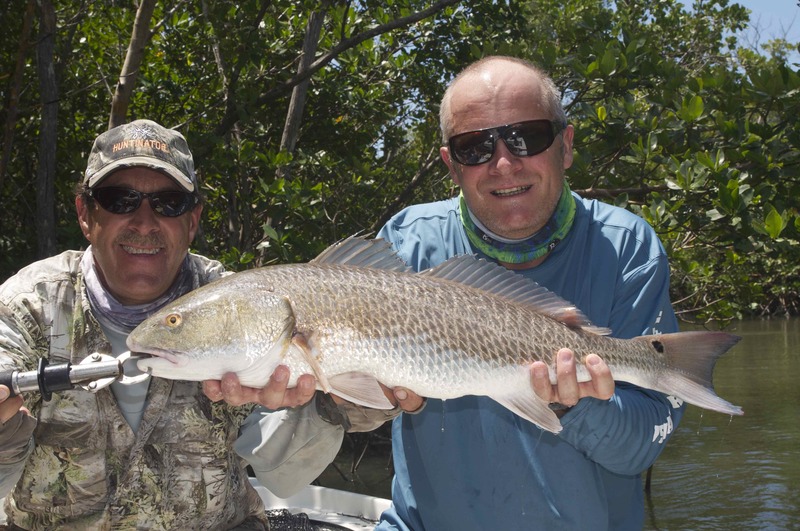 Bill Bassett, two other members of our regular crew, Ray Jennings and Bob Clements, were fishing with Jim Wilcox. 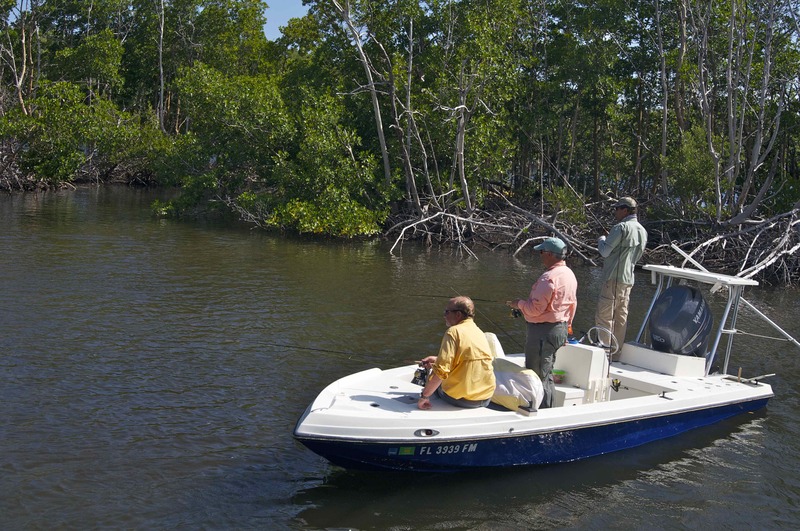 It was almost a two hour trip, but finally the two captains throttled back and we slipped into a narrow and all but hidden creek, and started heading into thick mangroves. The excitement and anticipation of the fishing we were hoping to experience in this little touched, rarely fished corner of Florida was difficult to contain. 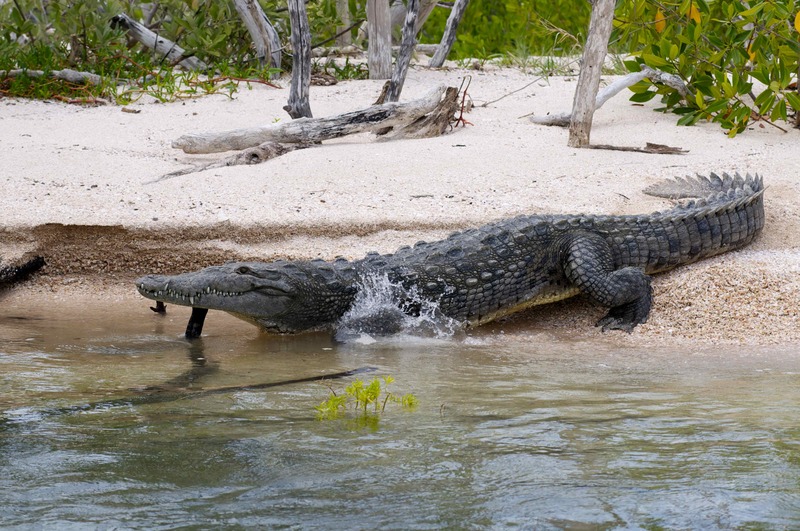 Cruising slowly, moving deeper and deeper inland, we passed huge saltwater crocodiles that stared back at us with their coal black, malevolent eyes, daring us to leave the safety of our boats and enter their domain. The birdlife was incredibly rich, while all around us we could see the clear, tannin stained waters teemed with dense shoals of shimmering bait fish. Eventually the narrow labyrinth of channels we had been following opened up into a tranquil lagoon, tranquil that is aside from an occasional explosive splash as some hapless baitfish met its demise within the jaws of a hungry predator. Also we could see the pronounced vee-wakes of cruising fish disturbing the glassy calm surface of the water on top of the shallower flats. It was an inspiring sight, and as I selected a live shrimp, pinched off it’s tail and mounted it on a 1/4 ounce jig then cast it towards an overhanging dead tree on the adjacent shoreline, my fingers were trembling. 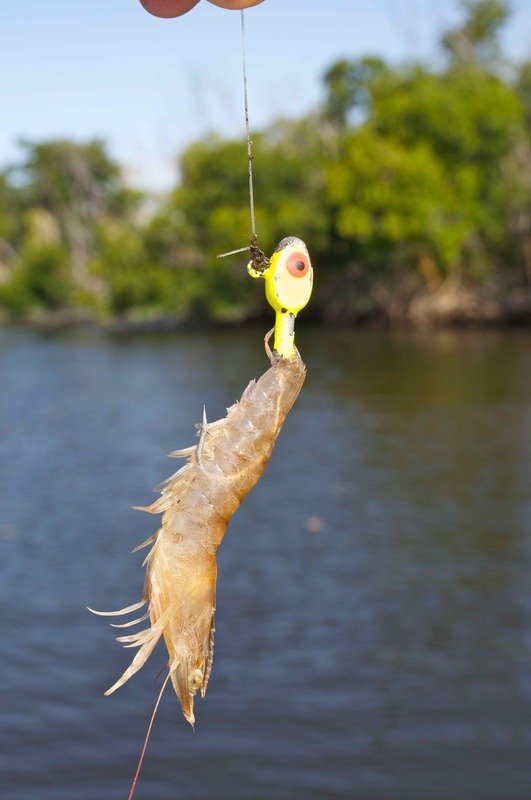 Fishing a jig/shrimp combo it standard practice throughout The Florida Keys. 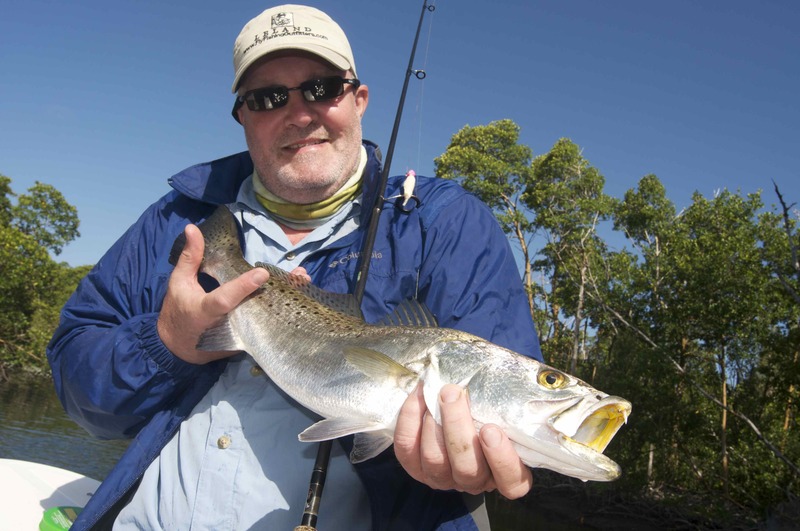 Its a simple yet very effective technique with which I have caught dozens of different species of fish including speckled trout, ladyfish, bonefish, redfish, snook, snapper, grouper, bluefish and various members of the mackerel family. Using a light spinning rod, the technique is to cast, allow the baited jig to sink, then slowly twitch/jig it back. Bites are fast and usually extremely savage, and it is necessary to strike instantly else you’ll reel in little more than a bare jig. It usually take a few casts to zone into the particular mood the fish are in that day, to work out at which depth and speed they want their shrimp presented and to sharpen your reflexes, but once you do get a handle on things you start to assemble a respective tally of releases. That morning bites came instantly, but mostly these were aggressive little mangrove snapper or pinfish that can strip a four inch shrimp off your jig with a speed and efficiency that has to be seen to be believed. 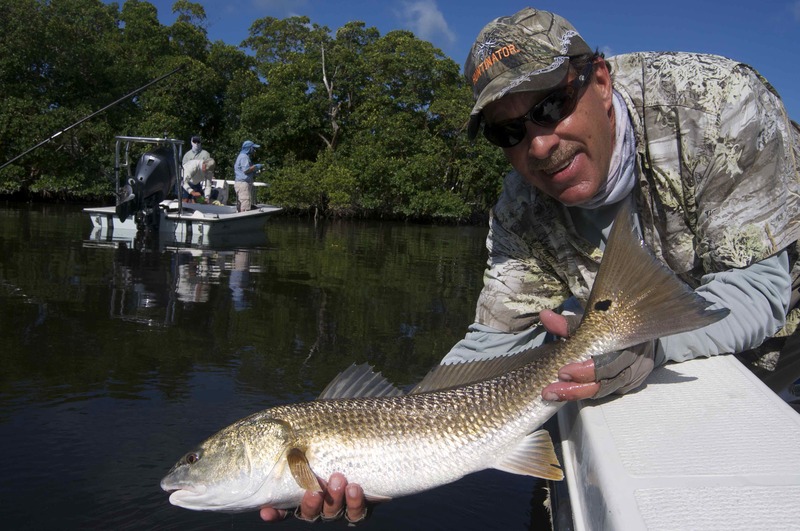 A cast into the deeper feeder channels that snake their way through the shallow flats would usually result in either a speckled trout or high leaping lady fish. 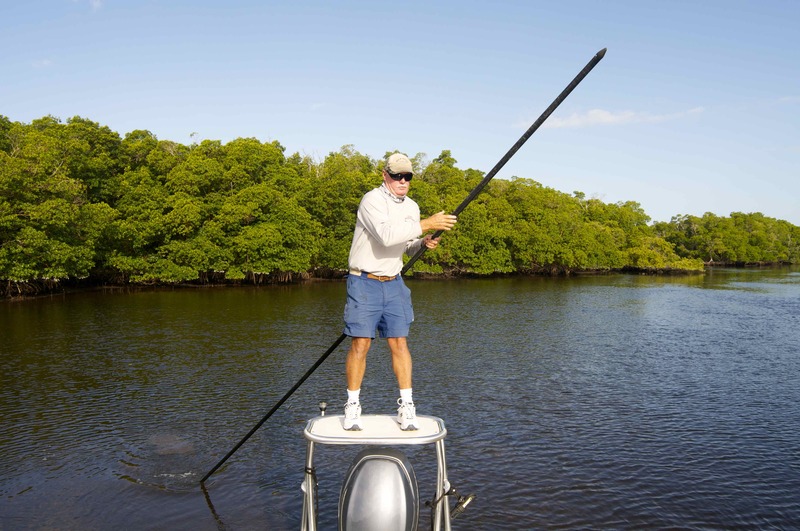 Poling us slowly along within comfortable casting range of the edge of the mangroves, it wasn’t too long before Bill spotted a redfish tailing enticingly along the edge of an oyster bar. Andrew was perfectly positioned to make the cast, which he executed beautifully, dropping his baited jig about 10 feet in front of the foraging fish. 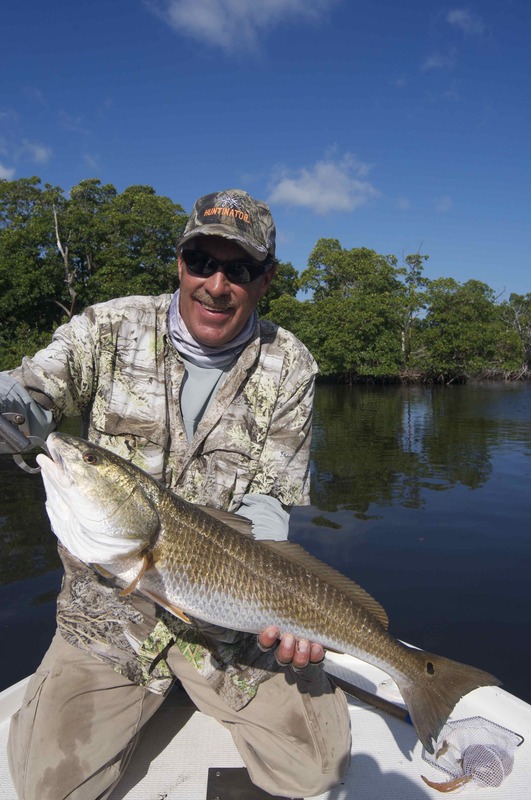 He waited a moment or two, watching as the fish got closer, then just when it was a couple of feet away he gave the jig a subtle switch and that redfish surged forward and engulfed as if it hadn’t eaten anything in months. Andrew set the hook, at the same time applying maximum side strain to steer the fish clear of the tangle of mangrove roots. Five minutes later he was posing in front of my cameras holding a solid 5lb redfish, its burnished flanks and characteristic black tail spot glowing gold, copper and bronze in the rich morning sunlight. During the next hour or so we caught plenty more hard fighting reds, the bigger specimens approaching 10lb, along with a few decent snook, but all to soon it was time to head back out into open water and run back to Islamorada. Not surprisingly we returned to the same area the very next day and the day after that, and as our precision casting improved along with our guides detailed knowledge of the area we were fishing grew, so our catch rate soared even higher. 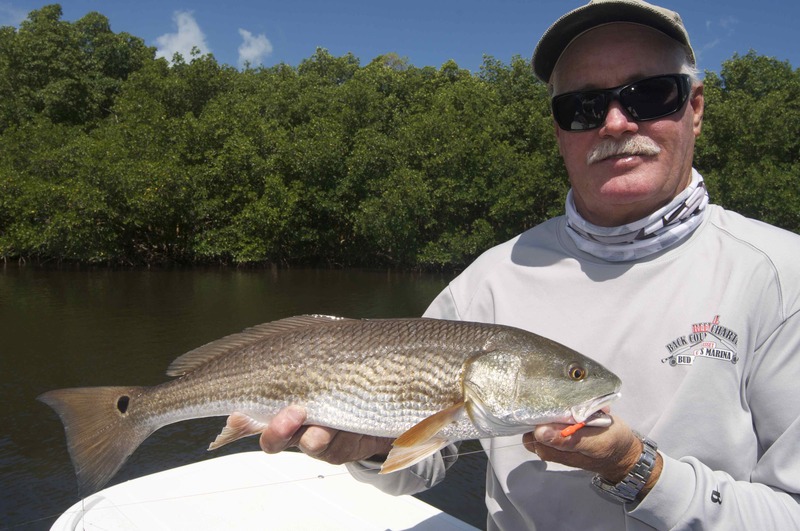 Now we were averaging 50 plus reds per boat a day along with reasonable numbers of snook along, an occasional black drum, lookdown, mackerel and even a solitary small permit. 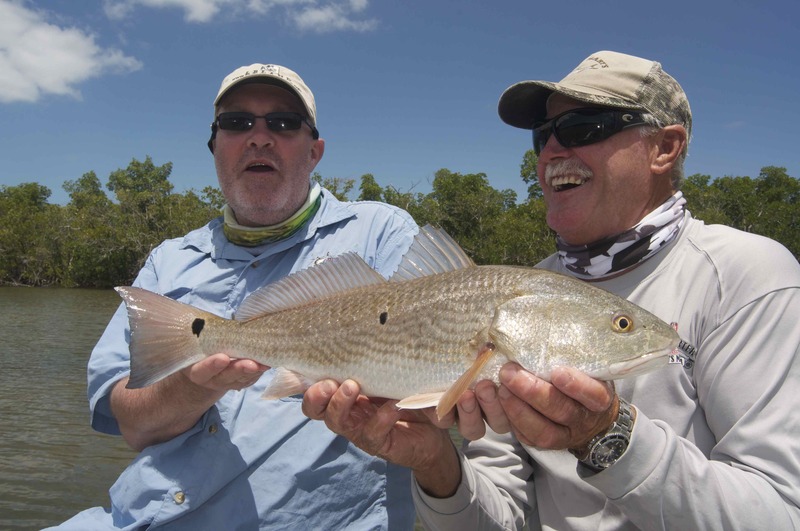 Each day we switched captains and on day two Andrew and I were fishing with Jim Wilcox. Keen to make the most of the day it was still dark as we slipped out of the marina. The wind was still blowing hard from the south east and at times the sea was rough, but as soon as we left open water and once again entered the mangroves, we entered a different world. The first spot we fish was at a sharp bend in the main channel, at a point where a small secondary channel entered the main slew. Jim tied us off onto a mangrove branch in the perfect position to work our jigs around the deep outside edge of the channel. 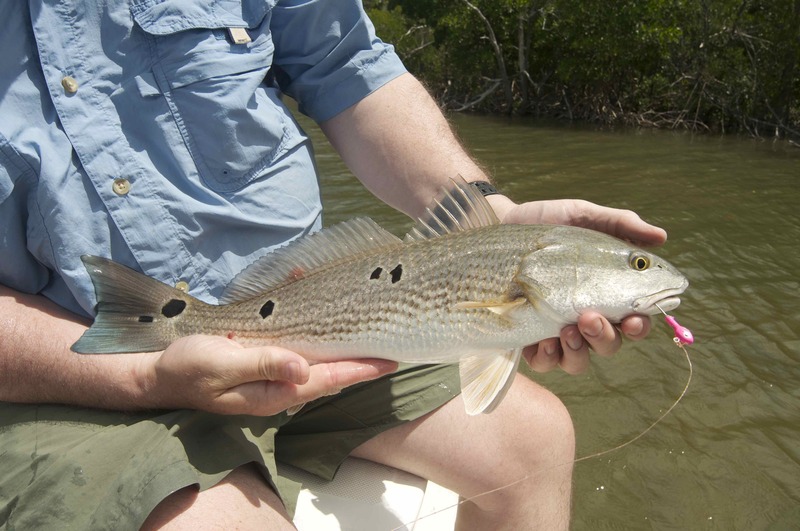 We started catching fish immediately, mostly speckled trout, snapper and ladyfish, but I soon discovered the redfish were feeding deep inside the feeder channel. It was a bit like trying to cast a jig into a lobster pot and most casts end up hanging from the mangrove branches, but about one in three hit the right spot and most of these resulted in a fish. During the next couple of hours Jim took us deeper and deeper into the mangroves, and we caught fish pretty much wherever we went. 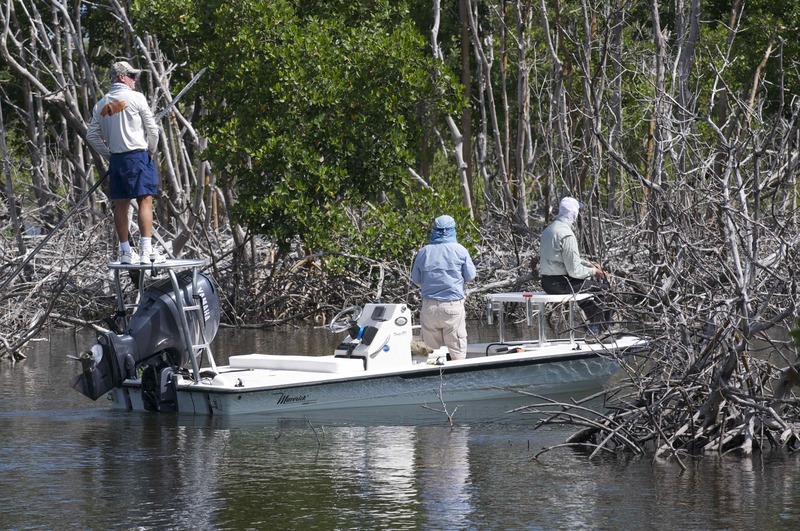 At times we had to pull the boat through a dense tangle of mangrove s for several hundred yards, and at the end of each of these we found another secret lagoon that clearly had not been fished in years, if ever. It was while attempting to break through one of these heavily overgrown creeks I caught my biggest redfish. We had been pulling and pushing the boat for about 10 minutes and the deck was covered in a thick carpet of leaves and twigs. At times the bugs were unbearable, but driven by that crazy anglers desire to find even better fishing we pushed on. At one point the creek opened slightly, at a point where yet another narrow drainage ditch entered it. We could see the water was deep and knew it would hold fish. I recovered my rod from beneath the debris on the deck, pinched the tail off a shrimp, mounted it onto the jig and lobbed it towards the back edge of the hole.